Sometimes we need a reminder to start Small, we can’t always GO BIG!! 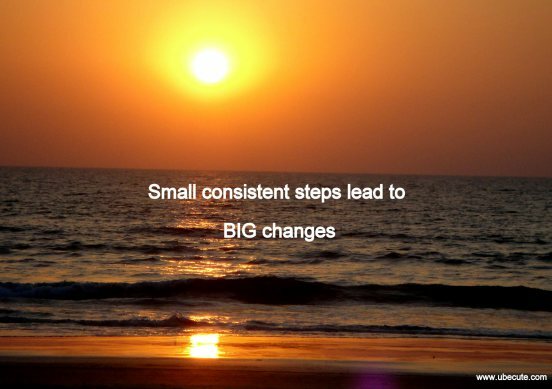 Success involves making a series of small incremental efforts over a long period. I am always wary of people who offer a secret mantra as a permanent solution to all problems. The truth of the matter is that there is no one magic bullet that will cure all evils, solve all your problems, and change your life around permanently. If you want to dream big, then learn the power of “small”. Small changes bring big results: If you want to write the next great American novel, then you will have to write it one page at a time. Your first draft may look nothing like the novel you will end up writing eventually, but making small improvements will add up in the end. Breaking a big task into smaller tasks makes your goals attainable.